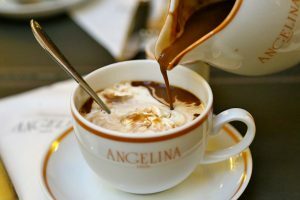 If you’re a sucker for pistachio flavor in sweets, the Angelina Tearoom is the perfect place to indulge yourself. Even if pistachio isn’t as popular in Angelina as their chestnut-flavored offerings, there’s definitely still plenty to enjoy. To start, try the Pistachio Financier. Unlike most of Angelina’s sweet treats, the Financier doesn’t look like much. It’s basically a tiny loaf of cake. But boy does it pack a pistachio-flavored punch! Once you’ve finished that off, move on to the Délice Framboise-Pistache. Don’t be surprised when you’re served with a bright pink pastry. All the pistachio goodness is underneath! The bottom layer is made of a crunchy pistachio biscuit, layered with pistachio cream. On top of that, there is also an almond biscuit topped by the terrific, bright pink layer of raspberry mousse. A dollop of pistachio cream on top further enriches the experience. An order of ice cream would be the perfect ending to your pistachio fete. You can order two scoops of ice cream served with a dollop of whipped cream. Of course, you can always order double of the Pure Sicilian Pistachio but you can also sample it with another of Angelina’s delectable ice cream flavors. Your best bet would be either the Mont-Blanc (chestnut) or the Caramel au Beurre Salé (salted caramel). Before you go, order some french macarons to take with you. You can opt for either the larger individual portions or a box of the mini versions. Either way, the pistachio is a good choice. Other great choices are chestnut, raspberry, and chocolate. Are Rental Cars Cheaper Than Taxis? Tokyo Travelers Guide © 2019. All Rights Reserved.